Remodeling a small bathroom on a budget shouldn’t be scary. It is of course, easy enough if you have the money, to hire a contractor and an interior designer who can carry out any project. On the other hand, for those on a budget, this may not be an option. There is something to say for the person who uses their imagination to come up with alternative options when finances are tight. Bathrooms are one of the most important rooms in the home and even if you are living in a small area, there are many things which can be done to revamp it. Simply changing a few key parts such as the sink and the bathtub and shower, can change an old look into something new without hurting your budget. The old notion that one person’s trash is another persons treasure holds much truth. I recently found a fantastic hand thrown ceramic vessel sink in a thrift store. It came with a wooden stand; however, I chose to build this piece into an old kitchen cabinet by cutting a hole in the top and plumbing it. I fauxed the cabinet to resemble a dark wood, which went great with the sink. This piece is one of a kind; exactly the element I felt was important to add. If you do not feel confident to change out these pieces yourself, a plumber can do this or hire a licensed and bonded handyman instead. There are vessel sinks which can be found online that come in glass, ceramic, porcelain, stone and copper. Simply changing out an old sink can do wonders for a small bathroom. If your bathroom is space challenged, you can still have a bathtub, though it may smaller. There are still deals out there to find 5’ claw foot tubs. Sometimes someone may be giving it away or selling it for a nominal cost. Make sure they have their feet and that the porcelain inside is in good shape. This can be your shower as well, using a circular shower curtain that goes completely around so that the water stays inside. This is a creative way to utilize the space instead of having a separate bathtub and shower. It may be a consideration to choose the Japanese style tub which is great for soaking. These traditional bathtubs are made from wood, which would feel grounding with its warm earth colors. Many tubs are made with the small bathroom in mind. Whether you can buy new or must find it second hand, there are unique choices which will fit just right in your space. Many people are under the assumption that color makes a room look smaller, especially when there is not a lot of room. In my experience, the right colors enhance rooms. I chose to take two colors which were in my ceramic sink and paint the walls with one of them and stain the doors with the other. Bathroom color themes should reflect who you are. You may prefer more subtle colors such as sage green or soft rye. These colors work well with just about anything. On the other hand, darker colors can work well alongside light fixtures and countertops, as long as there is adequate light. 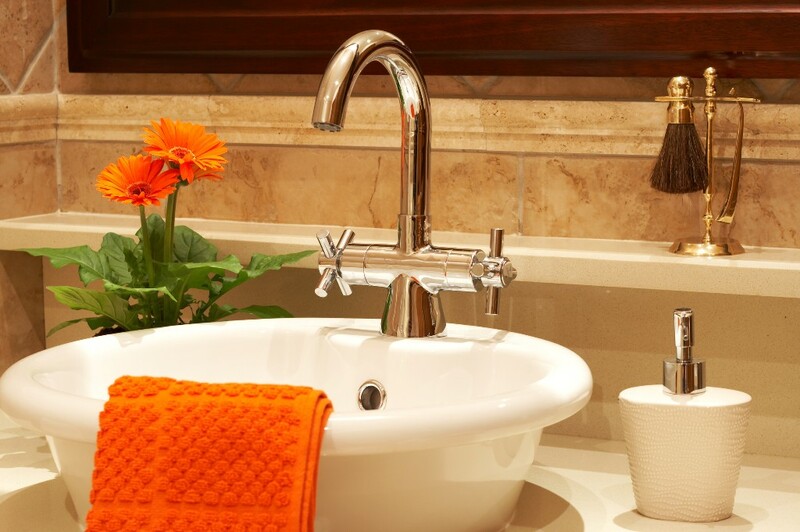 Warm earth colors in rust and mahogany can enliven a small bathroom without making it feel enclosed and cramped. A small bathroom is a fun challenge. Since it is a place that time is spent in, it should feel comfortable and look beautiful.